All our professionals at Tanglewood Dental Office maintain the highest levels of accreditation and pursue ongoing education to stay abreast of the latest trends in dentistry. Dr. Bindu Pandya graduated in 1993 from India and immigrated to Canada in 1997. With her strong academic achievements and four years of professional experience, in 1999, she was successful in getting her accreditation from Royal College of Dental Surgeons of Ontario in 1999. For the last 12 years, Dr. Pandya has being working at dental offices in Hamilton, Kitchener, Mississauga and Oakville In all, patients have always appreciated her kind and gentle approach as well as her ability to explain even the most complicated procedures in simplified terms. Dr. Pandya continues to enhance her clinical skills and adapting newer technology by attending numerous continuing education courses. She has recently completed a one year course in Implant Surgery. 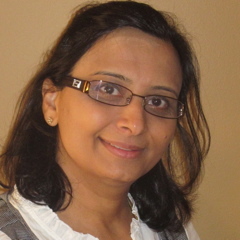 In August 2011, Dr. Pandya fulfilled her own personal aspiration and ambition by inaugurating state of the art Tanglewood Dental Office in Oakville that uses innovative and interactive computer technology to provide quality dentistry in comfortable and relaxed environment. She offer Sleep or Awake Dentistry, Implants, Laser Dentistry and other value add services like Teeth Whitening, Oral Cancer Screening, Bad breath treatment, and Sports Guard. Dr. Pandya is a good standing member of Ontario Dental Association (ODA), Royal College of Dental Surgeons of Ontario (RCDSO), American Association of General Dentists (AGD), and American Association of Implant Dentistry (AAID). When she’s not busy perfecting other people’s smiles, Dr. Pandya enjoys listening to music, cooking variety of vegetarian dishes, reading and traveling.